Buy this item and earn 1,719 ClubPoints. 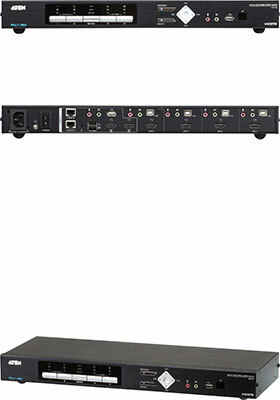 ATEN CM1284 4-port USB HDMI multi-view KVMP switch improves the operational efficiency of real-time monitoring. CM1284 allows users to manage the data more efficiently by allowing multiple sources to be selected, switched, and displayed at the same time with independent keyboard and mouse control. Advanced video support provides a better-defined HDMI connection with video resolutions up to 4K (4096x2160 @ 30Hz). CM1284 guarantees users a real-time monitoring functionality by offering dual outputs on console side. 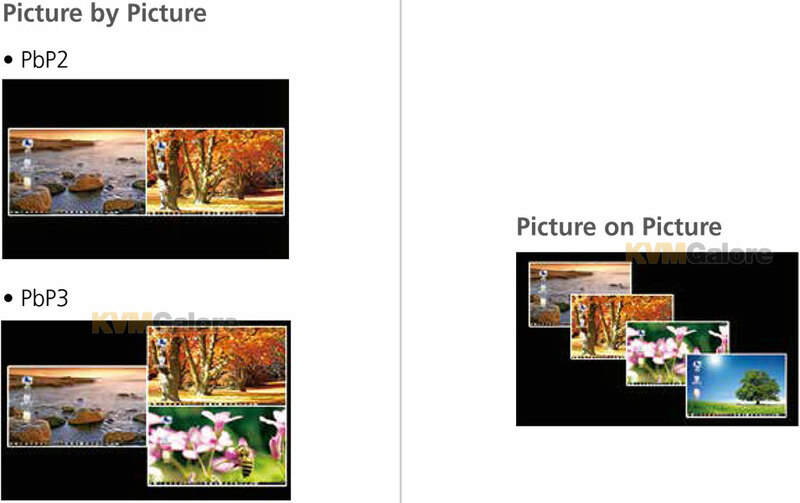 One provides Quad View, Picture in Picture (PiP), Picture by Picture (PbP), and Picture on Picture (PoP) display modes, while the other one provides Full Screen mode. Featuring Boundless Switching, CM1284 allows users to simply move the mouse cursor across windows to switch to other video sources. This makes it easier to instantly access and control the target computer. With Daisy Chain Control (DCC) capability, users can control up to 3 additional CM1284 units (for a total of 16 computers) via a single keyboard/mouse, with each additional unit displaying video from its connected computers. 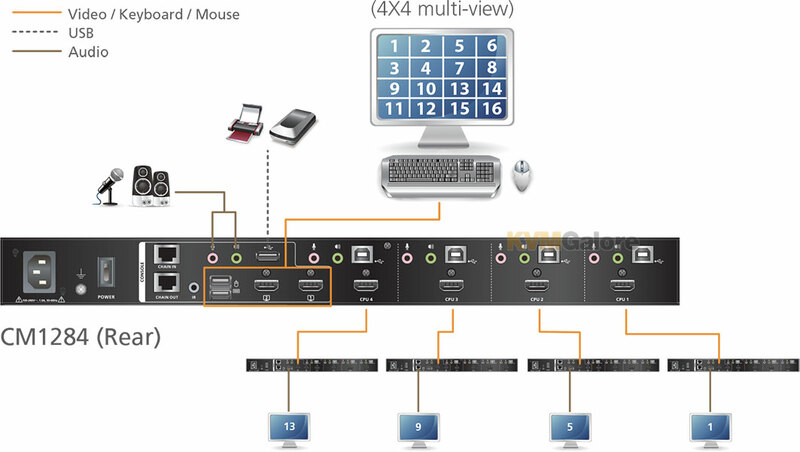 In addition, CM1284 can be cascaded up to 2 levels to reach the maximum of 16 video sources to be simultaneously selected, switched, and displayed in multi-view mode (up to 4x4) and a single keyboard/mouse control. Engineered to meet the ever-increasing demand for multi-view functionality, CM1284 is specifically designed for where real-time monitoring is needed such as aviation industry, financial trading, and medical application. ATEN CM1284 4-port USB HDMI multi-view KVMP switch charts a revolutionary new direction in KVM switch functionality by combining a 4-port HDMI with a 2-port USB hub, and providing different display modes, including Quad View mode, Picture in Picture mode (Dual, Triple, or Quad), Picture by Picture mode (Dual, Triple, or Quad), Picture on Picture mode, and Full Screen mode. Control and switch between computers/video sources is versatile using the front-panel pushbuttons, IR remote control, on-screen display (OSD), RS-232 commands, or through hotkey combinations entered from the console keyboard. CM1284 allows users to access 4 computers/devices from a single console, consisting of a USB keyboard, USB mouse, and HDMI monitor. With CM1284, you can connect up to two monitors - one acts as the main control and supports all the display modes, and the other acts as a secondary display that only shows a channel selected from the main monitor in full-screen mode. Video switching for the second monitor is easy with Boundless Switching which allows you to switch channels simply by moving the console mouse to the desired channel on the main display. As a USB hub, CM1284 permits each computer to access connected peripherals on a one-computer-at-a-time basis. CM1284's independent switching feature allows the KVM focus to be on one computer while the USB peripheral focus is on another. There is no need to purchase a separate USB hub, as well as separate stand-alone peripheral sharers. CM1284 further improves on previous designs with HDMI connectors, and the transfer of keyboard and mouse data to the computers via a fast, reliable USB connection. As with the USB peripherals, the audio focus can be independent of the KVM focus. A Daisy Chain Control (DCC) port allows the user to connect and control up to four CM1284 switches via a single set of keyboard and mouse. This enables the use of only one keyboard/mouse over several computers by switching the console keyboard and mouse focus to the monitor of each secondary station. This is convenient for growing networks that need to monitor and manage more computers - daisy chain up to four units and switch between up to 16 computers/video sources. You can also choose to have all sources displayed on one monitor by cascading, where CM1284 units are connected to one another via its KVM ports. In a cascade setup, you can control and monitor up to 16 computers (4 additional CM1284 switches) using a single console. Setup is fast and easy: simply plug cables into their appropriate ports. There is no software to configure, no installation routines, and no incompatibility problems. Since CM1284 intercepts keyboard input directly, it works on Microsoft Windows, Linux, Sun and Mac platforms. CM1284 improves operational efficiency for a wide range of practical applications, including control rooms, monitoring systems, and traffic control centers, as well as process control centers, server rooms, medical industries, broadcasting, production and automation, aircraft and vehicles. In combination with projectors, it is also used in presentations and conference rooms. Allowing you to switch seamlessly between four PCs, and share USB peripherals and stereo audio, CM1284 is ideal for multimedia applications, and offers the ultimate in space-saving, streamlined KVM technology. 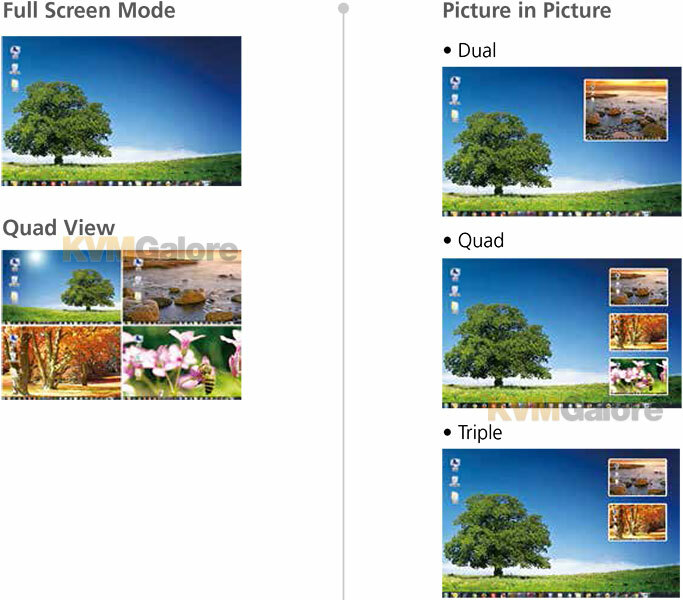 CM1284 supports Quad View, Picture in Picture (PiP), Picture by Picture (PbP), Picture on Picture (PoP), and Full Screen mode. User can change size and location of each video source and easily click on demand to control PC. Boundless Switching is a patented ATEN technology. By moving the mouse cursor across different windows, users are allowed to switch KVM focus among multiple sources on multiple windows. The mouse cursor can be moved to another window in any direction and instantly access the target computer. • Daisy-chain: Up to three (3) additional CM1284 units can be daisy-chained via the daisy-chain in/out ports allowing the user to control up to 16 computers via a single set of keyboard and mouse. Each CM1284 unit connects to its own monitor and displays its connected computers in multi-view mode. 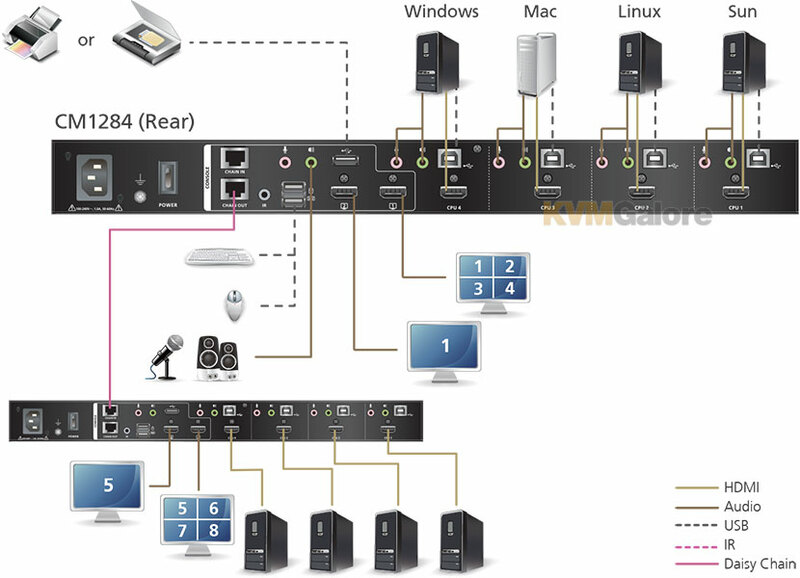 • Cascade: Up to four (4) additional CM1284 units are connected to the main CM1284 unit via its KVM ports, allowing for up to 16 sources to be displayed on one monitor (with up to 4x4 multi-view mode). - One (1) cascaded unit supports multi-viewing up to 7 sources. - Two (2) cascaded units supports multi-viewing up to 10 sources. - Three (3) cascaded units supports multi-viewing up to 13 sources. - Four (4) cascaded units supports multi-viewing up to 16 sources. ATEN's exclusive Video DynaSync™ technology automatically detects the horizontal and vertical offset values of each computer's display settings and synchronizes them with the monitor users are working on, ensuring that the display resolution will always be correct when switching among different video sources.